Our personal experiences with classical music began as young children – we are sisters, and for one of us it was insisting that our mother put on ‘Zadok The Priest’ by George Handel at the highest volume while stomping through the house conducting; for the other it was Classic FM that rocked me to sleep every night. We have not stopped performing and educating ourselves about music since, and the happiness that it brings is unparalleled. Growing up, there was no emphasis on black people in classical music – it was the Russian greats and French Nocturnes that became our repertoire – to the point where we actually thought we might just be the only black women classical pianists in the world. Now, we are aware of extremely talented and celebrated black musicians in the classical community, such as conductors Wayne Marshall and Roderick Cox, cellist Sheku Kanneh-Mason (of royal wedding fame), and opera singer Angel Blue. The preconceptions around classical music are starting to change, and a new BBC series looks set to help that. Marking 100 years of classical music in Britain, Our Classical Century is a four-part documentary displaying the impact classical music has made on British culture, musically and socially. 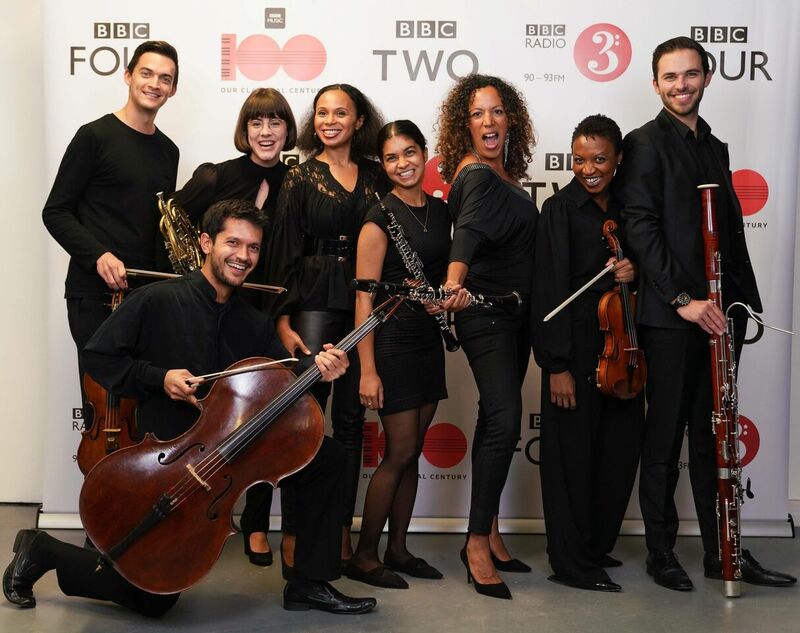 With full participation from all the BBC orchestras, the series will feature presenters such as Suzy Klein, Alexandra Burke and Sir Lenny Henry, each reflecting on their own connection with classical music. The series aims to captivate a new audience. “This is an open door experience for those who don’t know the BBC and what rich culture and knowledge they have to offer,” says BBC radio and TV presenter Suzy Klein at the launch event. The four-part series began in mid-November, coincidentally marking the centenary of the First World War, and will continue right through to the first night of the Proms 2019. We had the pleasure of attending the launch party for Our Classical Century. In a warehouse with stunning acoustics, the evening featured live performances from the BBC singers, members of the Chineke! Orchestra (the first professional orchestra in Europe with majority BME musicians) and a unique DJ set from British composer Gabriel Prokofiev. Presenter Klein, along with violinist Elena Urioste and Sir Lenny Henry took to the stage and began a discussion about effecting musical and social education between young people and classical music. This documentary was developed to show that there is a great humility in exploring the unknown. As black women who are classical pianists, music has shaped our lives and, as both of our pursuits for great music deepens, so does our love for it. Classical music is often marketed to a predominantly white, European audience, and the idea of approaching it as a PoC newbie can seem daunting because of preconceived opinions of what this world has to offer. Classical music is in many ways an antique form, but it is also a continuous, evolving genre, where its musicians, composers and performers are becoming more diverse – and so should its listeners. Our Classical Century will be a prominent element to attract a new wave of listeners and allow us to, “look through the lens of the past through the testament of composers”, as said by the director general of the BBC, Tony Hall. So, to the familiar and unfamiliar: welcome and welcome back to a totally immersive, year-long celebration of classical music over the past 100 years; we’re sure you will stumble upon something that just may resonate with you. Maybe it could even be something that will make you turn up the volume and stomp around the house. Part One of Our Classical Century 1918 – 1936 is available to watch on iPlayer now: watch it here.